National DNA Day commemorates the successful completion of the Human Genome Project in 2003 and the discovery of DNA's double helix by James Watson and Francis Crick in 1953. This annual celebration offers students, teachers and the public many exciting opportunities to learn about the latest advances in genomic research and explore what they may mean for their lives. Individualized health care means better health care, and the Center for Individualized Medicine is leading to increase capabilities for doctors to — for each unique patient — predict and perhaps prevent some diseases, take earlier action when diseases do arise, and choose the most effective medications and treatments while minimizing their side effects. Eric Green, M.D., Ph.D., director of the National Human Genome Research Institute (NHGRI) at the National Institutes of Health (NIH), spoke at the Individualized Medicine Conference last year, reflecting on the last 10 years of research and advancement since the completion of the Human Genome Project.a position he has held since late 2009. 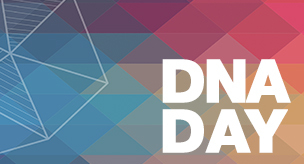 Mark your Calendars for April 25 to celebrate DNA Day with us!